It's a brand new month, and time for another fun challenge at V's Sweet Ideas. One of the newer items in V's Sweet Shoppe are these great treat bags. I've used the Gold Bag to create this little pocket. I also tucked in a Chic journalling tag that's on top of the smaller Bitty Bag. V's Sweet Shop has several adorable new bags that are great for gift-giving. I will use this one to tuck a small gift and card inside. 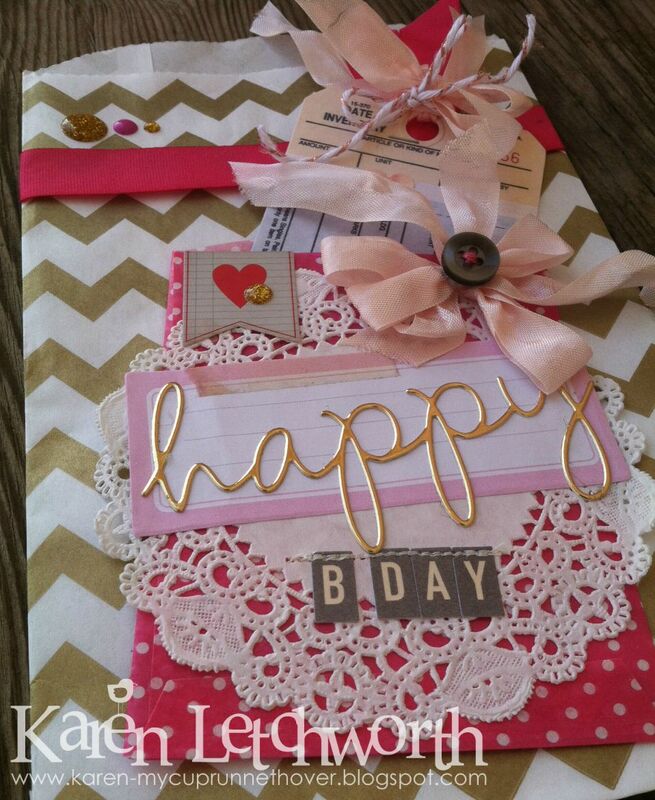 I added some of V's Sweet Dots and trims including May Arts Crinkle Ribbon, May Arts Fuscia 5/8" Lightweight Ribbon, and some Gold Baker's Twine tied into my tag. 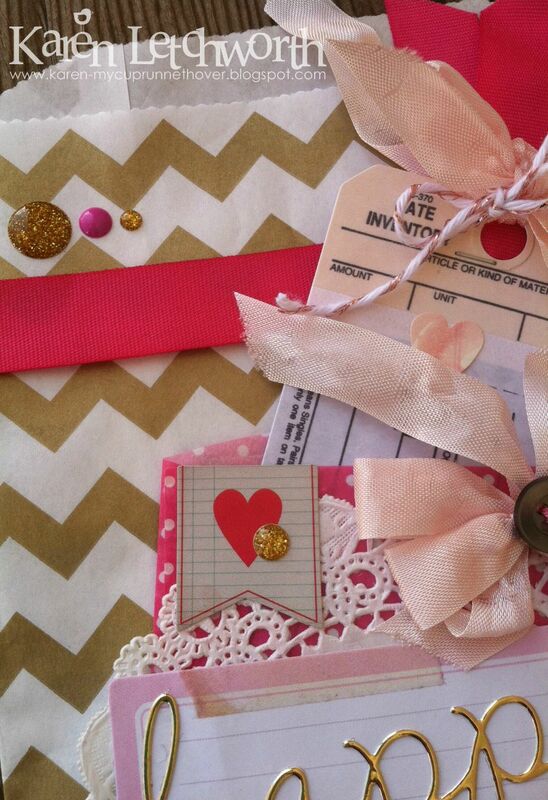 I also included an adorable little Chic Tags Love Notes Mini tag and some Gold and Pink Sweet Dots. I like taking close-up photos so that you see all the great textures and sweet touches you can add to your projects with V's Sweet Ideas great products. Isn't that ribbon just super sweet? There are so many great products at V's Sweet Ideas. I really hope that you will stop by V's Sweet Ideas to do some shopping in her sweet store, and then come by to play along in this months Anything Goes FUN CHALLENGE on V's Sweet Ideas Blog. We love having you join us, and YOU could be the lucky winner of a gift certificate to the sweetest little shop around! Craft Heaven Shop Inspirations - August Challenge - BINGO - I chose the third vertical row of Die-Cuts, Buttons and Bling. My die-cut is the word happy, my button is on the pink bow, and the bling comes from the sweet dots in gold and my word in gold. 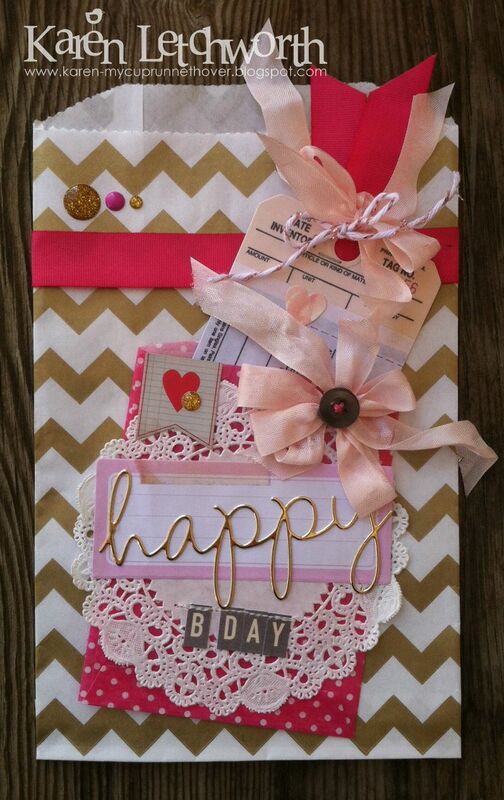 What a fun blog, challenge and shop! Stop by to check it out and play along. so cute you make the sweetest things with all your different bags, Lovely I am sure who ever receives this will love it. What a pretty little bag.... love it! Have a blessed week, Karen. What an adorable little bag! I love all the added details! This is so pretty, Karen. I really like those gold accents. They make your card pop with personality. Great job. This is sooooo pretty Karen! Love all the little details you added..